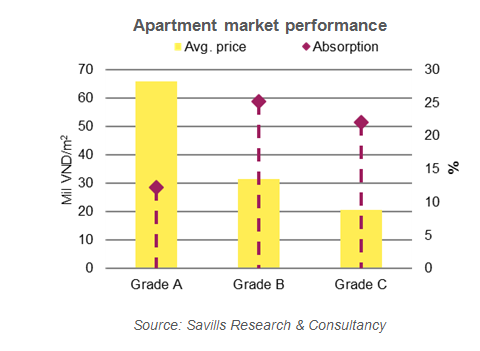 Savills releases latest quarterly report on Hanoi and HCMC. As at the end of the third quarter of 2018, total primary supply in Hanoi’s apartment market was 27,380 units and inventory nearly 21,000 units, according to Savills’ quarterly report released on October 10. The report noted that 13 new projects and the next phases of 18 projects provided 6,910 units, down 29 per cent quarter-on-quarter but up 12 per cent year-on-year. Sales were down 16 per cent quarter-on-quarter but up 11 per cent year-on-year. 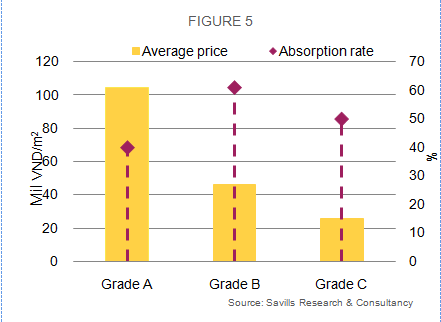 The absorption rate fell 4 ppts quarter-on-quarter and 1 ppt year-on-year, to 24 per cent. The average asking price was $1,330 per sq m, up 6 per cent quarter-on-quarter and 5 per cent year-on-year. Grade B continued to dominate, with 60 per cent of stock, followed by Grade C with 33 per cent. Meanwhile, in Ho Chi Minh City, 14 new projects and ten launches of new phases provided over 7,700 units in the third quarter. Primary supply fell 26 per cent quarter-on-quarter and 47 per cent year-on-year to 18,800 units. There were over 10,000 sales, down 30 per cent quarter-on-quarter and 13 per cent year-on-year. Absorption was 53 per cent, down 3ppts quarter-on-quarter but up 21 ppts year-on-year. Grade C continued to dominate with a 54 per cent market share. Grade A sales increased 58 per cent quarter-on-quarter. To 2020, supply is expected to be approximately 124,000 units from 94 projects. District 9 is expected to have the largest share, at 32 per cent.